Poster featuring Loïe Fuller at the Folies Bergères by Jules Chéret. Portrait of Loïe Fuller, by Frederick Glasier, 1902. 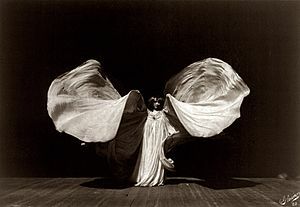 Loie (or Loïe) Fuller (January 15, 1862 – January 1, 1928) was a pioneer of modern dance. She had no dance training, but got experience acting on the stage. A chance experiment with an over-long skirt gave her ideas which she eventually developed into a dance. Fuller was born Marie Louise Fuller in the Chicago suburb of Fullersburg (now Hinsdale, Illinois). She began her theatrical career as a professional child actress and later choreographed and performed dances in burlesque (as a skirt dancer), vaudeville, and circus shows. Fuller developed her own natural movement and improvisation techniques. Fuller combined her choreography with silk costumes illuminated by multi-coloured lighting of her own design. 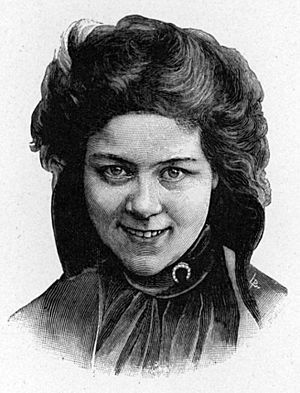 Although Fuller became famous in America through works such as Serpentine Dance (1891), she felt that she was not taken seriously by the public. Her warm reception in Paris during a European tour persuaded Fuller to remain in France. A regular performer at the Folies Bergère with works such as Fire Dance, Fuller became the embodiment of the Art Nouveau movement. An 1896 film of the Serpentine Dance gives a hint of what her performance was like (the unknown dancer in the film is not Fuller). Fuller's autobiographical memoire "Quinze ans de ma vie" was written in French and published by in 1908 with an introduction by Anatole France. She drafted her memoires again in English a few years later, which were published under the title "Fifteen Years of a Dancer's Life" by Herbert Jenkins (London) in 1913. The New York Public Library Jerome Robbins Dance Collection holds the nearly complete manuscript to the English edition and materials related to the French edition. 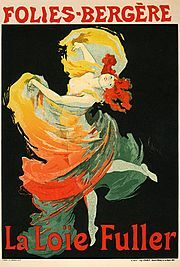 Loïe Fuller at the Folies Bergère, poster by PAL (Jean de Paléologue). Fuller depicted by Koloman Moser (1901). Loie Fuller Facts for Kids. Kiddle Encyclopedia.